Subscribe to comments with RSS or TrackBack to 'Ask Collier 1/28/19'. You’re right – Davey couldnl’t get much worse, so probably better. I think the rotation should be clearly better 1-4. #5 – who knows? I love Joe Ross, but he’s on an innings limit, and 6-10 is.. well, about the same I guess. So, okay, slight improvement. About Harper – if he signs here, you have to figure Eaton gets traded either immediately or in March/April to free up cap space. I agree 100% with you on Martinez. Here’s hoping he is able to learn from the massive mistakes. Todd, I hope you’re right on Harper and Rendon.Fingers crossed. 1). The longer Harper/Machado go unsigned, the more I think I was right in the last post about MLB owners being concerned that the league is heading into some serious financial headwinds. 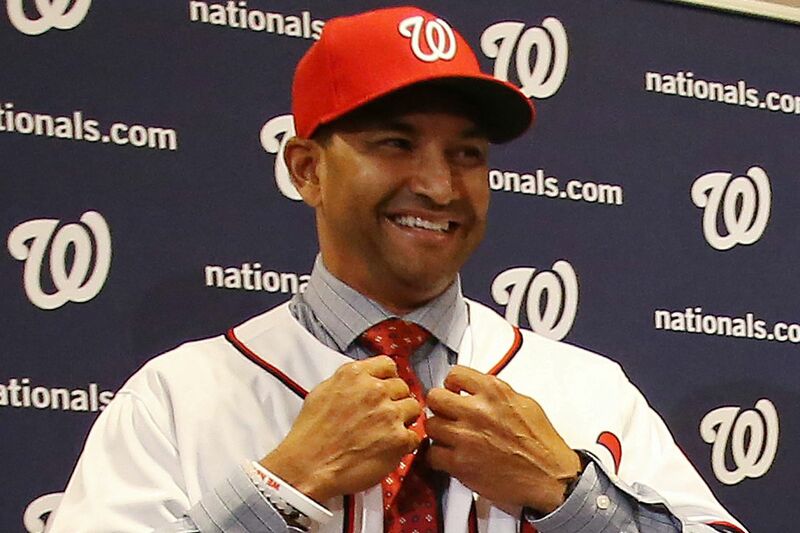 Who would have thought at the end of January the Nats would have made the biggest free agency splash, but it would not have involved either of those guys? 2). What could Martinez do in spring training to help the team? Resign. 3). I think they’ll end up signing a low cost bullpen lefty for the pen right at the start of Spring Training. Lots of guys still available out there, and the market appears to be collapsing. 4). I think it’s either/or, and how any Nats fan could wish for Harper over Rendon is beyond me. 5). Not a lot of candidates for a “surprise” breakout on such a heavily veteran team. Borque’s a good one–and how about betting on Turner to finally have an All Star season and become a more valuable SS than Machado? Oddly, the quieter things stay, I think the greater likelihood there is that Boras is talking with the Nats. If that deal were to get done, it would be done with a fair amount of secrecy. I find it really hard to say how “likely” a deal with the Nats would or wouldn’t be. My guess right now is that it’s unlikely, but more than 5%. I’d say 10-15%. However, the only known offer to him is the 10/300 one from the Nats at the end of the season. For all the bluster, particularly from the Phils, there hasn’t even been a hint of another offer. If the Phils were going to strike, it really seemed like they had to close the deal within 10 days or so of meeting with Bryce. That window has passed. The Dodgers have also seemingly closed their window. As Boz noted, there are very, very few options left for Bryce and Boras. It’s a nutty offseason, and Wally made a lot of good points late on the last thread. One could argue that there are a few things conspiring against Bryce and Manny. One is the salary cap. Nearly all the big-spending teams are up against it, including the Nats. Another is the realization that no player should have a 10-year guaranteed contract, ever, in any sport, even if it starts for an age-26 season. Such a contract makes no sense for the future of a franchise. Just look at the Pujols, Cabrerra, and Cano deals. Yes, all three of those guys were older when they signed, but in retrospect, the deals still would have been turkeys if they had been three years younger. The other huge factor right now is that with no other known teams legitimately in the bidding, Bryce and Boras have no leverage. If I’m negotiating with them, either with the Nats or some other mystery team, I’m shortening the years and reducing or eliminating opt-outs. I’d start with something like 6/$210M ($35M AAV) with one opt-out after the 4th season. I’d much rather pay a higher AAV over fewer years (with a fair amount deferred, of course). I wouldn’t go more than seven years. If he doesn’t like it, good luck getting something better elsewhere. And oh by the way, this offer expires in two days. Take it or leave it. I like Karl’s prediction of Trea for a break-out season. I’ll toss Eaton into that mix if he can stay healthy. Both have the talent to top 6 WAR (which Eaton did with the Chisox). I think Robles is going to have a roller-coaster year. He may be Rookie of the Month in April and hit .210 in May. He’s been working out with Soto, so I hope Soto can teach him the arts of patience and adjustment. The other big thing with Robles, of course, will be staying healthy. For the spring, the overriding question seems to be Ross vs. Fedde for 5th starter. There are also some back-of-the-bullpen questions to settle. I do think there are some real LH questions there, as Nuno has reverse splits like Solis, and I’m still not convinced that Grace is as good as his 2018 numbers, particularly in higher-leverage situations. But I agree with Todd that they’re too maxed out to add anyone else at the moment. Sipp really would have fit well, but to add someone like him now, they’d have to dump MAT’s salary. And yes, by all means, show a little spine and make Zim play a few games in the spring. I prefer signing Bryce to a Rendon extension, even at the much higher price for Harper. There are basically two reasons for this preference: (1) Bryce is 2.5 years younger than Rendon, and his free agency comes a year before Rendon’s, so you’re getting 3.5 years of “younger” performance with a Bryce contract compared to a Rendon contract. Going purely by age and estimates about age-related decline, if you like Rendon on a 6-year deal, you should like Bryce on a 9.5-year deal. (2) Rendon derives a substantial amount of his value from defense whereas Bryce derives the vast majority of his value through his bat (and a little through baserunning). Normally I prefer more well-rounded players to players that are exceptional at just a few things. This is why I thought Robles was a better prospect than Soto. Robles, with his speed and defense, can contribute value in a number of ways even if he doesn’t hit much better than league average. Soto, on the other hand, needed to hit like one of the best ten hitters in baseball to be a star-type player (so far, it looks like that is what he’s going to be). But given their respective ages, I think Rendon’s defense is going to age sooner and more quickly than Bryce’s bat. We’ve recently experienced the decline phase of an exceptional defensive 3B. I don’t think Rendon will decline as sharply as Zim, but that should be a cautionary tale. And let’s be honest, Bryce is a MUCH better hitter: Bryce is a 140 career WRC+ hitter and Rendon is 123. And Bryce has put up those substantially better numbers at a younger age than Rendon has. Howie Kendrick has a WRC+ of 107; the difference between Harper and Rendon is roughly the same as the difference between Rendon and Kendrick. But of course, I’d like to sign them both. I don’t care at all about whether the deals are for too much money. The Lerners can afford it. Kevin — I think you’re right that Eaton would be traded if Harper re-signs. The later it gets in the offseason, though, the trickier that proposition gets . . . and the less likely the Nats are to get a good return for Eaton. There are good teams out there that still need OF help, though; the Indians and Giants come immediately to mind. I thought at one point that the Giants might be a darkhorse for Bryce, but Zaidi seems to have brought the Dodger skepticism of such contracts north with him. Derek — I share the skepticism for the all-in mentality on a Rendon extension. I wrote about it on a post or two ago. I think I accidentally had him a year too old, but he would still be past 30 when an extension would begin. I would like to have Rendon for three or four years beyond 2019, but he’s going to want at least six, maybe seven. My price point would be low 20s AAV, which I think is reasonable and likely. The problem is that the big difference is whether it’s over four or five seasons versus six or seven. As with Harper, I’d rather pay more for fewer seasons. For Rendon, maybe 4/$100M vs. 6/$140M. Derek–the Lehners “can” afford to re-sign both Harper and Rendon, but they won’t. It’s all about cash flow, and even with Harper the Nats rarely ever came close to selling out last year. If Harper wanted to be the highest paid player in the game, he should have gone out and performed last year. Instead, he whined and moped and didn’t start hitting until the team was already falling out of playoff contention. That’s why no team has been in a rush to sign him. If he mostly stunk during his contract year, what’s he going to do once he no longer has any incentive to play better? There’s really no evidence to support the theory that players generally play better in contract years, so I’m not sure why that point is relevant. Some players do play better, some play worse, and some play about the same, which (a) is precisely what you would expect and (b) makes the contract year no different from any other year. Also, who cares whether Harper wants to be the highest paid player? The important issue is whether having Harper on the team would make the team better (it would). The less important issue (though perhaps only slightly less important) is whether Harper is worth the money he ultimately signs for. It’s impossible to take a position on that without knowing what his deal turns out be. But, even now, I think 10/300 is a team-favoring deal for him (though if the Nats can get him for less, they should do it). And finally, if the Nats’ management forces a choice between Harper and Rendon, then I think Harper is the right choice because he’s a lot younger and a much better hitter (and I say this with a great deal of admiration for Rendon and an openness to the idea that Rendon is *right now* a better player overall than Harper, which is of course a different issue from whether we should expect Rendon to be better than Harper in 2019, 2022, or 2025). I don’t think this choice is necessary; one of the (many) nice things about having billions of dollars is that you can have your cake and eat it too. But if the choice is necessary, then I choose Harper. Harper now rumored to be flirting with San Diego. I’m fine with that. It would get him out of the NL East and leave him on a team the Nats likely wouldn’t see in the playoffs for the foreseeable future. It sure wouldn’t be a high-profile place where Bryce could stay in the spotlight, though. Also, I agree with Derek that the Nats/Lerners could re-sign both Harper and Rendon if they wish. They’d likely be permanent residents above the tax line, though. I’m conflicted how prudent either extension would be, though. As noted above, my issue is much more with the expected length of the contract than it is with the prospective price. I’ll add that I don’t think any of the current scuttlebutt closes the door on a Bryce-DC reunion. In fact, my bet is that Boras has been waiting to get a legit offer from elsewhere to give him some leverage with the Nats. All in all, I just want things settled. I imagine the entire Nats camp does as well. As it is, it’s starting to look like they’re going to open camp with it all still hanging over their heads. I can’t help but think Bryce with the Padres would be partially influenced by Werth having come to an up and coming team to be a leader and help change the course of the franchise. We know they are close and have probably had some conversations about what Werth was thinking at the time. Maybe that appeals to Bryce if he has to abandon hopes of largest contract or largest AAV.